North Korea appears to be upgrading one of its two rocket launch sites, US experts say, perhaps in a move to test bigger rockets. "Important progress" had been made at Tonghae Satellite Launching Ground since October 2012, the analysis from the 38 North website said. 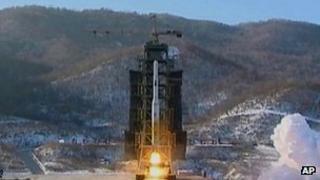 That launch - condemned by the UN as a banned test of missile technology - took place at the Sohae launch site. Construction of the new launch pad was continuing, it said, with images showing Pyongyang would be able to test rockets "perhaps three to four times the size of the Unha [launched in December 2012] when construction is completed, possibly in 2016". "That activity may be related to another round of modifications intended to support future launches of the Unha rocket or possibly another liquid-fuelled missile," 38 North said, while cautioning that more information was needed.